The growth of alternative finance in recent years has been largely due the difficulty small businesses have had obtaining traditional bank loans. Wondering where the alternative funding model booming and which industries have been the most enthusiastic? 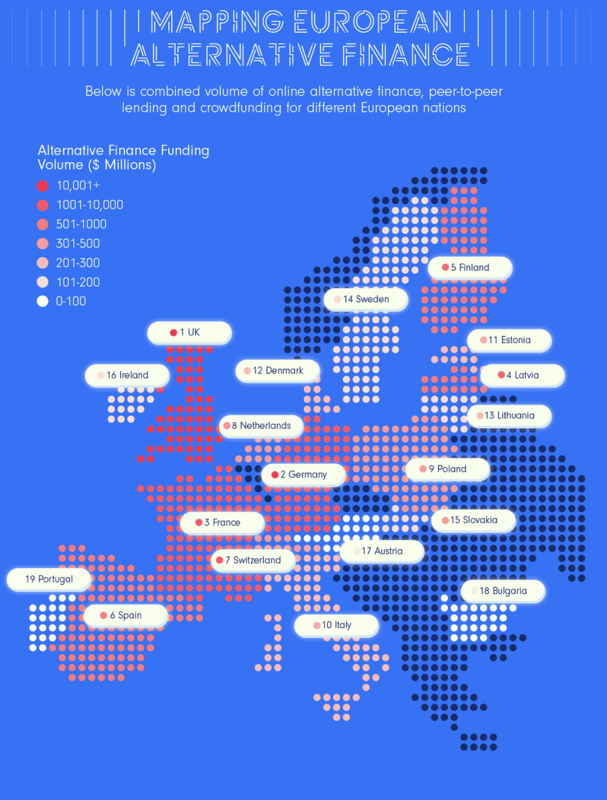 Below is combined value of online alternative finance, peer-to-peer lending and crowdfunding by European country. Crowdfunding is one of the most important financial mechanisms in existence. We’ve taken 175 projects that received over $1 million in funding and broken them down by sector. We’ve compared the volume of alternative finance contributions per capita to GDP per capita so see which nations are developing more sophisticated marketplaces for alternative finance. Data for alternative finance and crowdfunding were pulled from recent reports from both 2017 and 2018 studies. Crowdfunding case studies were sourced from a variety of platforms and collated to give an overall ranking for projects that were funded in excess of $1 million.